Two prominent iFilmGroup actress went to jail for their most recent dramatic performance. Two scenes were filmed in Chatham for the 1hr long dramatic film Blue Love that featured the film’s lead actress and iFilmGroup acting coach Helena Rose. The scene also featured iFilmGroup member Maysee Mclean. How the jail scenes fit into the story line the film’s director and iFilmGroup co-founder Matthew Marshall will not comment. When iFilmGroup’s other co-founder and Community Emgagement Manager- Don Hickey was asked about it, he had this to say, “Matthew Marshall as a director is always pushing the envelope in his films to enhance the viewers experience and evoke emotion and reaction in his films. It’s his trade mark “social justice style” says Hickey. Marshall often takes on social justice causes and likes to make people feel the experience and cause a reaction. In doing that style of film making it often lands him in some interesting place for locations for filming. “It’s all part of the experience, not only for the viewer but also for those involved in cast and crew. It opens people up to experiences that are different”, says Marshall. Both actresses have never really been to jail and found the experience one that they are glad was just part of acting and not real life. The film shoot created some very dramatic images and footage for the film. Both actresses look the part in their orange prison outfits and taking on the roles of their characters in the hard cold steel prison cells. “It left me with a feeling that it was all very real and can trigger some anxiety within yourself. I can’t imagine actually having to be in jail” says Helena Rose. She is not only the lead actress of the film playing the role of Kaitlyn Butler but she is the co-producer and co-writer of the film with Matthew Marshall. The experience affected the other actress involved in the scene as well. Maysee McLean plays the role of Piper Keys in the film. McLean felt that overall the experience was something that definitely fed my curiosity. 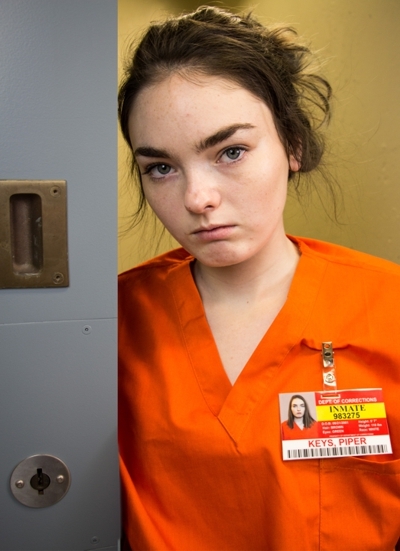 “I was able to see what a real jail cell looks like and, having to portray the type of emotion of a real prison inmate would be feeling in that situation of being locked up. It helped me to gain more acting experience that I will continue to benefit from”, says McLean. Marshall did share that one of the scenes involved a very dramatic break down by Helena Rose’s character about being locked in the cell. All the stress, and emotions of the event along with depression, anxiety all are brought together to create a very emotion and heart-wrenching scene for the character. The footage for the scenes will add a very real life feel to the film that will go along with the hard edge of much of the other footage that is sure to make the film something that draws people in as it deals with very real life issues that many people can relate to. Up next for the m & s Marshall Production and iFilmGroup team are scenes at Fanshawe College for Blue Love taking place in a hospital ward which will be filmed in one of Fanshawe’s medical simulation rooms. Scenes for the film are almost done. After the filming at Fanshawe the team will take a break for the holidays and will pick up in the New Year with the final scenes for the film.